Barnga is so easy to use that its procedure is a joy for both the experienced and the inexperienced game facilitator. The game almost immediately involves all its players and supplies are easily procurable. Careful planning of the follow-up debriefing period helps assure that all participants will become aware of and reflect on the learning's of the exercise. Barnga was created by Sivasailam “Thiagi” Thiagarajan in 1980. Players form small groups of, say, four-six players each. Each group sits separated from the others. They receive a modified deck of cards (each deck containing only the same few cards) and a sheet of rules for playing a new card game called “Five Tricks.” They have a few minutes to study the rules and practice playing the game. Once everyone has the hang of it, the facilitator collects the rule sheets and at the same time imposes a strict command of “no verbal communication.” This means that players may gesture or draw pictures if they wish, but may neither speak (orally or by signing) nor write words. Clearly, communication, should it be needed, is going to be more difficult henceforth. Since the game is so simple and so short, this artificial barrier to communication forces the players, within the simulated setting, to be as creative and alert as possible. Frequently at this point there is a little nervous laughter, some stifled last words, and finally a settling in to playing “Five Tricks” without the written rules and in silence. The facilitator then announces a tournament. As in any tournament, some players leave their home table and move to another, some from that other table have moved to yet another, and so on. They sit down at their new table, look around, and begin at once playing “Five Tricks.” Shortly thereafter an almost imperceptible change is felt in the room, then expressions of uncertainty. . . murmurs of frustration. .. chuckles… fists banging on tables. The tournament, with more movement to other tables, continues for another ten minutes or so amidst growing uncertainty, frustration, laughter, banging on tables. Sometimes someone is all ready to claim a “trick” when someone else reaches out and takes it. Sometimes someone makes an effort to draw a picture clarifying an uncertainty. Sometimes whoever was at the table first prevails, sometimes the more aggressive. When, during the debriefing, the facilitator probes for what might have been going on, someone takes another player to task for not learning the rules correctly. Someone else confesses that she never was very good at cards. Someone else speaks about others trying to cheat. And several suggest that each table originally had been given a different set of rules. Some are sure of this; others think it might be true; others hadn’t considered it. 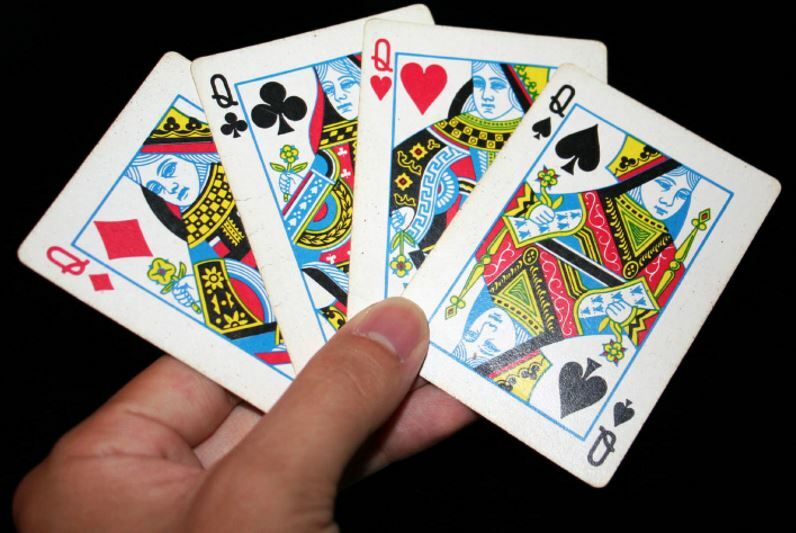 In fact, at the beginning of the game each group had received a slightly different version of a basic set of rules to “Five Tricks.” In one set, for example, Ace is high; in another, Ace low. In one set diamonds are trump, in another spades, in another there is no trump at all. Variations on these few differences are the only differences, no matter how many groups are playing. This means that virtually everything except one or two aspects is the same for everyone. You will have about 5 minutes to study the rules for and prac- tice playing “Five Tricks.” Then the rules will be taken away and no verbal communication will be allowed. From then on, you may gesture or draw pictures (not words! ), but you may not speak or write or use sign language. Then the Tournament will begin. You will have a few more minutes to play at your home table (in silence). Scoring begins at the start of the Tournament. Game Winner: The player taking the most tricks in the Game (one “hand”). If a game is not complete when the Round ends, the player winning the most tricks so far in that game wins that game. Each Round lasts a few minutes. The two players who have won the most games during a Round move up to the next highest numbered table. The two players who have won the fewest games during a Round move down to the next lowest numbered table. The other players remain at the table. Winning players at the highest table remain at that table, as do losing players at the lowest table. Ties are resolved by alphabetical order. What happened during the game/tournament? What are the ways 4-H is like playing Barnga? What does the game suggest about what to do when you are in a similar situation in the real world? How does this game focus on attention on the hidden aspects of culture?